Minnesota Lynx WNBA players honor Philando Castile, killed by police in Minneapolis. 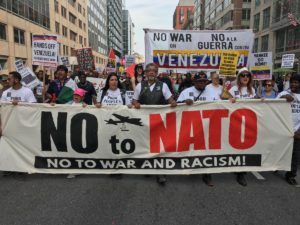 The Republican National Convention, which nominated the white supremacist, fascistic Donald Trump as its presidential candidate, has added fire under an already burning cauldron of police war against Black and Brown people. On July 18, the opening night of the RNC, Milwaukee County Sheriff David Clarke labeled the Black Lives Matter movement an “anarchy” and had the racist crowd cheering as he gleefully announced the third acquittal of another cop accused of murdering Freddie Gray, a 25-year-old Black man, in Baltimore last year. Then Trump, during his 75-minute rant on July 21 as he accepted the nomination — which took on the feel of a Ku Klux Klan rally — went on a vicious anti-immigrant tirade, along with deploring the killings of police. But of course the self-proclaimed “law and order” Trump did not mention the police killings of people of color. 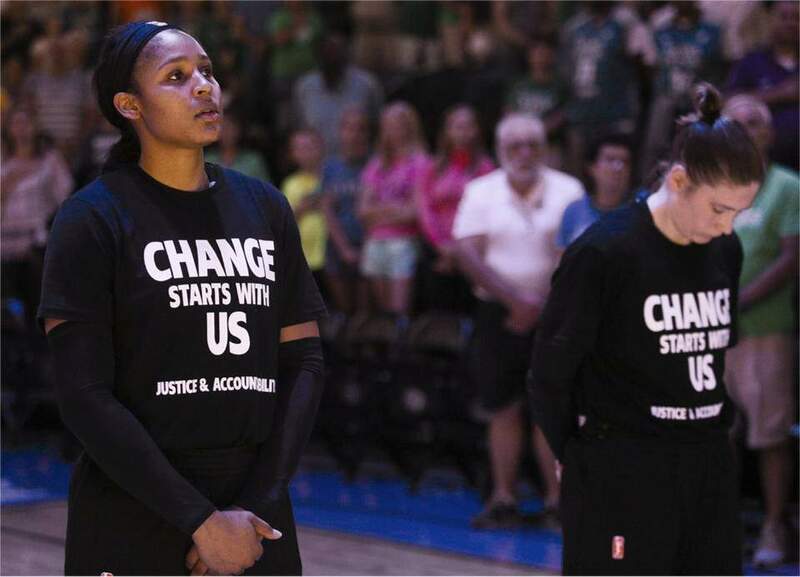 Minnesota Lynx, Washington Mystics and other players were fined by the league for wearing protest t-shirts. 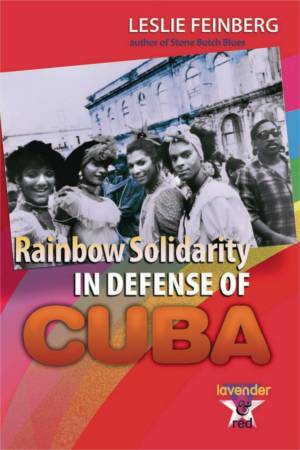 These groups and others are in the forefront of carrying out direct, in-your- face protests against police brutality. They promise more coordinated actions at police stations and offices around the country — indicating they don’t give a damn about who is running in the elections. The statement reinforced the fact that neither Trump nor the liberal facade of Hillary Clinton or even the ongoing police war have held back or silenced the Black Livers Matter struggle or diminished its impact on other sectors of U.S. society that have influence on the masses. Citing a violation of league rules and uniform guidelines, the WNBA hierarchy fined the Liberty, Fever and Mercury teams $5,000 each and fined individual players $500 apiece. Once the fines were announced, players from the Liberty and the Fever carried out a “media blackout” protest — they would only take questions from the media about Black Lives Matter and their actions, not about basketball. They also created the hashtag #Wewillnotbesilenced. When these players refused to back down, a groundswell of support exploded for them, especially on social media inside and outside the WNBA, mainly around BLM. 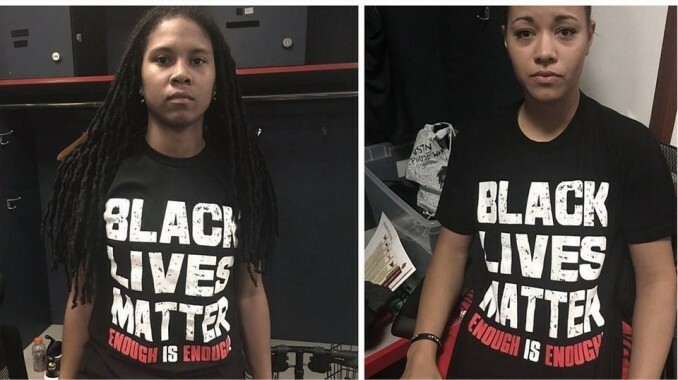 While the WNBA is over 70 percent African American, high-profiled white players such as Sue Bird and Breanna Stewart from the Seattle Storm expressed solidarity on their Twitter feeds with #Black Lives Matter and quoted Dr. Martin Luther King’s statement: “There comes a time when silence becomes betrayal.” The Minnesota Lynx and Washington Mystics players also voiced their support for their fined sisters. Carmelo Anthony said the fines were unjust, and the National Action Network volunteered to pay them. With so much outrage building for these players’ right to free speech, the president of the WNBA, Lisa Borders, announced July 23 that all fines would be rescinded. Many asked the important question: Would these athletes have been fined at all if the issue of BLM had not been raised so prominently, as opposed to violence in general? Whether it’s with direct action by shutting down interstates or police stations on the part of young Black activists or on the courts, athletes are using these arenas for their voices to be heard. And no one is waiting to see who wins the White House. They’ll keep building a movement against unjust killings and racial profiling in general by the police. Moorehead is the 2016 presidential candidate of Workers World Party.